Extra wide verticutting on flat terrains. De VCU200 is a 2 m wide machine for verticutting sports fields. A PTO drive shaft provides the drive and the required output is 22 HP (16 kW). The depth of verticutting is easily and continuously adjustable using the threaded spindle on both sides of the unit. The units are equipped with knives with 5 tips of manganese steel and are 3 mm thick or they are optionally equipped wit knives with tungsten tips. Optionally, the units can be equipped with gauge wheels (undulation kit) on the backside of the frame, for even better and more precise following of the terrain. 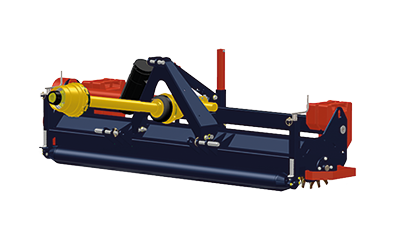 • Verticutting reel 2.0 m.
• Depth of verticutting can be adjusted easily and continuously. • Suitable for categories 0, I en II.